English Jokes Joks : Crispy Funny Jok of the Day Daily Humar Adult Comedy Sardar Doctor La: Doughnuts! 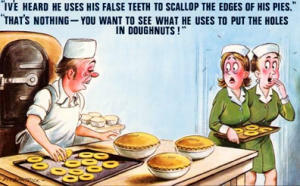 Iv'e heard he uses his false teeth to scallop the edges of his pies. That's nothing - You want to see what he uses to put the holes in doughnuts!